There is no doubt that this movie had the best production values of all the Sherlock Holmes movies made up to this point. Dark, cloudy London streets open up the movie with eerie music playing in the background. Holmes and Watson are in a box waiting for a play to begin. They are waiting for the Prince of Wales to arrive. Watson manages to get off a joke about Lestrade in the movie's first minute. When the Prince arrives he is booed as much as he is cheered; he is not a very discreet man. But there is a monster out on the street, strangling women with his bare hands. This is the third women killed in Whitechapel. Holmes wonders why he hasn't been asked in on the case. A citizens committee comes to 221B and asks Holmes to get involved. Meanwhile another murder occurs with the women being carried from the carriage in plain site of the driver. Something is not right. Holmes is chased away from the murder scene by Sir Charles from Scotland Yard. An anonymous informer tells Holmes where he can get information on the Ripper murders from Robert Lees (Donald Sutherland), a medium. We then see the Ripper dispose of the informer. A pretty creepy Robert Lees claims to have seen Jack the Ripper in his visions. Mary Kelly tells Holmes of a child in her cars and of the child's mother, Annie Crook. Annie Crook (Genevive Bujold), has been committed to an insane asylum. She hasn't spoken a word in six months and Sir Charles was instrumental in her committal. We find out that her and "Eddy's" baby has been entrusted to Mary Kelly, who everyone seems to be looking for. Holmes searches for Mary and finds he, a bloody corpse, with two men cutting her up. Holmes, recognizing the men, is startled and is struck down with a red hot poker. Watson comes to the rescue but he is wounded too. Holmes chases after the men. One is in a trance like state - totally out of it. 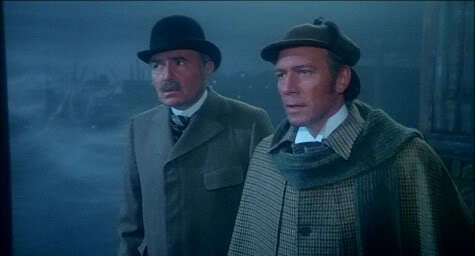 Holmes leaves him and chases the other - the man with the sword and after a fierce battle causes his death. The rest of the movie kind of wraps up what actually happened. The Prime Minister, the Home Secretary and Holmes go over the story of what happened. The heir to the throne had a child with a lower class women and a Catholic at that. The child became the target of those thinking they were helping and supporting the Crown. The helpers searched through Whitehall for the child, bringing along with them the myth of Jack the Ripper, by those hoping to disguise their work as that of a madman. Plummer and Mason did a great job as Holmes and Watson, I loved Mason's intelligent Watson in particular, although I will always love Nigel Bruce. The movie was a little talky and the Robert Lees character probably hurt the movie more than it helped it but overall, a really good Sherlock Holmes adventure.